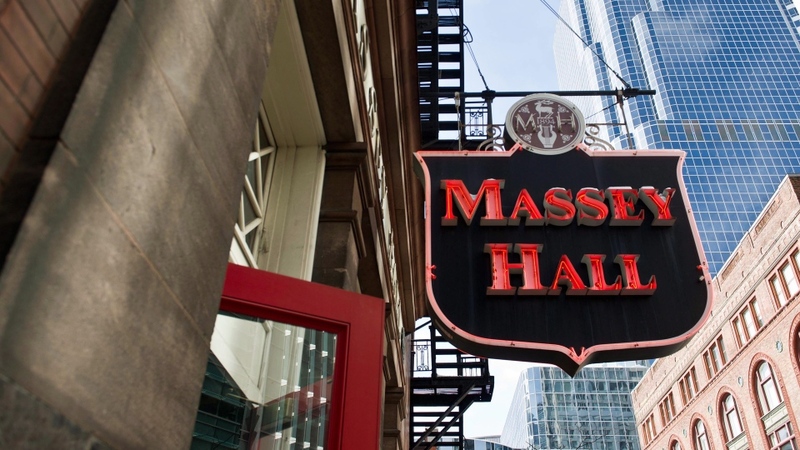 TORONTO - When Massey Hall opened its doors 125 years ago visitors were awestruck by the choral music venue's spectacular stained glass windows, says restoration expert Eve Guinan. In the daytime, sunlight poured through the magenta and rose panels, casting a transcendent glow over the audience, while at night the lemon and blue hues glimmered in the moonlight. Portraits of 12 famous composers adorned the Toronto building's exterior, from Bach and Beethoven to Handel and Chopin. Despite Massey being a strictly secular venue, it must've been a downright spiritual experience - but it wouldn't last long. Those windows were boarded up in the early half of the 20th century to muffle noise leaking in from the streets. Over the years, as Massey evolved into a space that hosted famous names from around the world, the windows fell into a state of disrepair. “From the outside, the stained glass was so dirty nobody actually knew it existed,” explains Guinan. Guinan's team of five glaziers at Toronto company EGD Glass are sharing the job of fixing the windows with another restoration firm, Vitreous Glass. 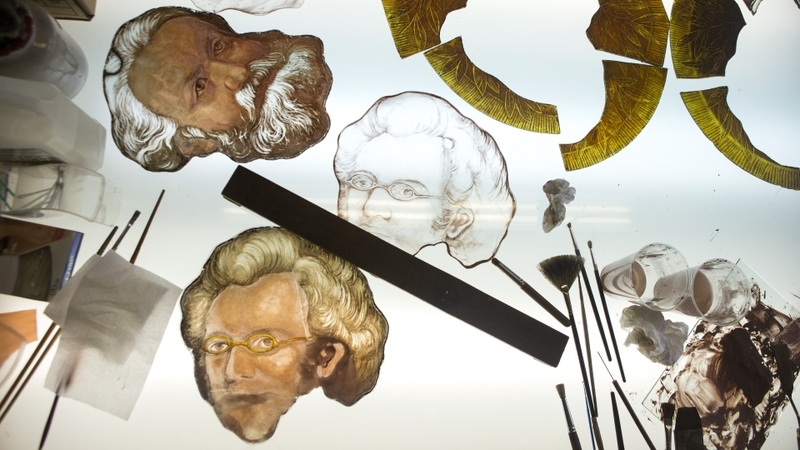 They scrub away the dirt, replace cracked glass, and touch up blemishes on the composers' faces, in an effort to rescue the 93 historic windows. It's part of Massey's two-year “revitalization” project, valued at $139 million and set to be completed in late 2020, that will inject new life to the venue. 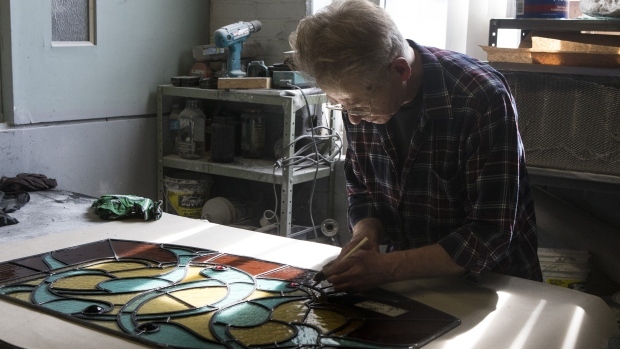 Massey was made legendary by its performers - including Glenn Gould, Gordon Lightfoot and Neil Young, who famously recorded his “Live at Massey Hall 1971” album in the space - but its stained glass windows carry their own storied history. They debuted when Massey Hall opened in the summer of 1894, created by the Faircloth Brothers, a Toronto shop that operated directly across the street from the venue. When the owners of the venue boarded up a number of the windows to isolate the building from persistent outside noise, their decorative accent was all but forgotten. Guinan learned of their neglect when she was hired in 1996 to patch up some of the attic windows. She found many of them had been spray painted with ceiling paint in the 1960s, she said. It led her to become involved in a more significant effort to save the windows - an initiative slowed by the usual financial setbacks and red tape. When the necessary heritage approvals were granted to remove the windows in 2017, Guinan and the owners of Massey discovered just how badly neglect had worn on them. “Pigeons had got between the glass and the plywood and it was completely full of straw and all sorts of material for nesting,” she said. They also learned windows for two of the composers - Bach and Beethoven - were missing from the collection. Decades earlier, both were removed to make room for the fire exits. Many people assumed they were lost forever, perhaps stolen by a sneaky collector. 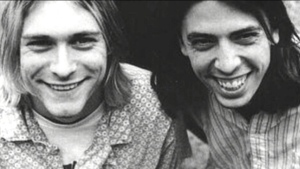 The publicized hunt for the missing faces eventually led to the basement of Roy Thomson Hall where they were found in unmarked boxes. Guinan doesn't spend much time dwelling on that story, since each painted composer is now meticulously catalogued inside her warehouse awaiting his restoration. Before that happens, each window is dismantled into its individual pieces, carefully washed, and reassembled like a jigsaw puzzle. Since they're considered heritage artifacts, the guidelines are strict around what can be done with each face. The original stained glass painting can't be modified, so instead the touch-ups are made on another layer of glass that's placed overtop of the original work, not all that different than modifications on a picture in Photoshop. When they're installed, each restored window will be placed behind a layer of clear glass protecting it from outside elements. On the inside, a blackout blind will close off the windows during concerts while another thick piece of soundproof glass will prevent those persistent noise problems. “It's like a big, huge sandwich,” Guinan says. The stained glass windows project will be finished around mid-summer, she adds, because the construction of the building relies on it. Interior details like the woodwork can't be started until the windows are installed. Guinan is hopeful the windows will add the perfect touch to bridge the past and present at Massey Hall. “It just proves, I think, that heritage can be part of modern as well,” she said.